The ring is designed to fit all kinds of shapes and sizes. The profile of the ring is formed as a U, which together with the opening/closing mechanism ensures that the ring does not tilt. The ring has an elegant setting that forms the top of the U-shape mounted with a big gemstone, and as the finishing touch, a diamond is placed on the side. Because of the opening/closing mechanism, the ring can easily be put on and taken off. The same size of ring can be worn on various sizes of fingers without being too loose or having a tendency to tilt. In that way the ring meets the needs of many people who have problems in finding a ring that suits them perfectly. 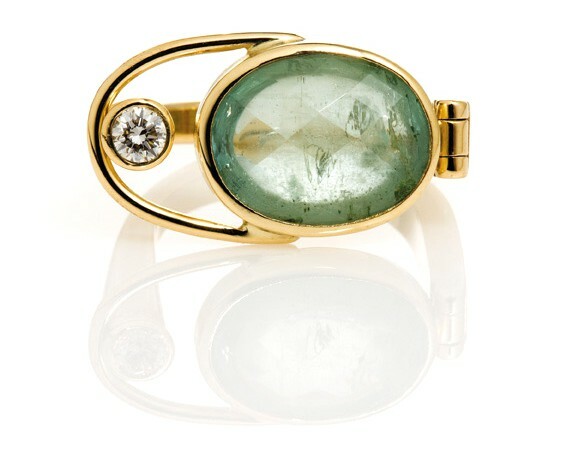 The gemstone is a green beryl which has a checker board cut on the top and a cabochon cut on the bottom. 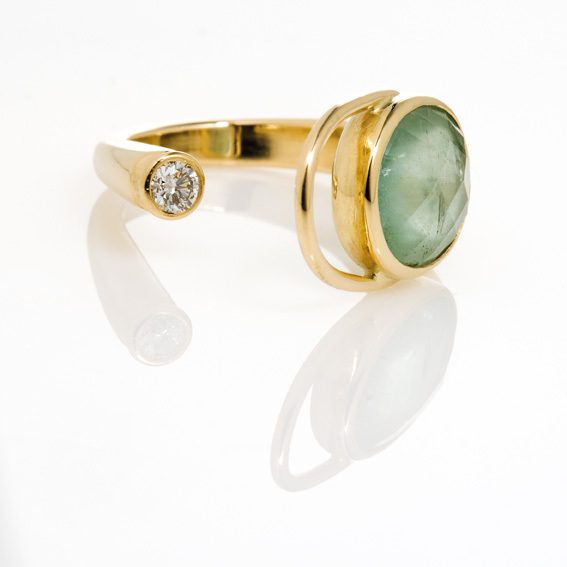 When wearing the ring, the stone touches the finger feels nice due to the soft shape of the stone. The Universal Ring is made in 18 kt.gold. Set with an oval green beryl and a 0.10 ct twvvs diamond on the side.